Some cool weather conditions and tough competition led to some fast times at Ocean County Park on Thursday. Jade Tricomy and Damien Dilcher both collected the individual titles and moved into the top six all-time at OCP. Christian Brothers Academy continued their 11 year championship streak and Middletown South took down some top ranked teams in the state. 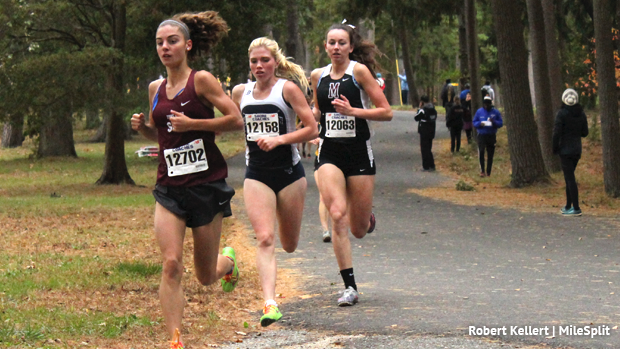 The girls race was a battle early on with Jade Tricomy of Toms River South, Madison Brand of Middletown South, and Rachel Kenny of Matawan. Midway through the race Tricomy made her move and Kenny answered pushing the race to the final straight where Tricomy won running 17:27 just ahead of Kenny's 17:29. Both girls move into the top five all-time at the Ocean County course with Tricomy now ranked third, only behind Molly McNamara who ran 17:14 in 2010 and Jillian Smith 17:18 in 2008. Kenny is now tied for fifth all-time with Marin Warner of Holmdel who hit the same time in 2013. Only a sophomore Tricomy now has two straight Ocean County and Shore Conference titles. Madison Brand's third place 17:37 helped lead NJ#7 Middletown South to their first Shore Conference title. Scoring 96 points they won a tight race with NJ#4 Colts Neck, 105 points, and NJ#10 Red Bank Catholic, 110 points. Coming through with a line of 3+6+23+31+33 the rest of Middletown South's top five finished as follows: Kathleen Shay 18:08, Danielle Smith 18:59, Tess Bizzoso 19:13, and Michelle Coyotl 19:17. Five girls went under 18 minutes; Amanda Stone of Monmouth Regional crossed the line in fourth at 17:44 and Colleen Megerle of Colts Neck just behind her at 17:45. Brick Township senior Damien Dilcher led a talent filled boys race with his winning time of 15:02. The major course PR moved him up to sixth all-time at OCP, tied with Mike Mazzaccaro who now coaches at CBA. Dilcher is Brick Twp's first individual Conference winner since Mike Ratta in 1996. CBA won their 11th straight Shore Conference team title in impressive fashion. They struck early with a 1-2-3 scoring run as Brian Hill finished second in 15:10, 12th all-time; teammates Luke Reid 15:11 and Troy Hill 15:19 were third and fourth. Reid is a junior and Troy Hill, Brian's younger brother, is only a sophomore! The rest of CBA's top five came with Ryan Miele in 12th at 15:39 and John Sheridan 17th 15:44. The Colts finished with 31 points (1+2+3+10+15) and an average of 15:24. Impressively Dilcher and company ran this quick even without state leader Devin Hart in the race. A week earlier Devin Hart of Pt. Pleasant Boro blasted a 14:51, tied for third all-time at OCP, to win the Ocean County title. We were getting ready to witness a potential course record run during Shore Conference Championships. Hart ended up resting this week to recover from last week and shape up for state season. Also running well was Louis DiLaurenzio of Raritan who ran 15:28 for fifth and Freehold Township's Nicholas Ackerman sixth at 15:29.